...... Allowing the use of different windows simultaneously, the work that have to be done gets easier. Wave Flow also has a complete CD player. Wave Flow is free to download and to try, and the best way to test it and to see what can it do is to download it and try it. - File menu: This menu lets you Open, Save, Print, and many more functions related to the file managing. - Tools menu: This menu contains the generic audio processing functions, like: Inverse, Reverse, Reverb, Eco, Effects, Fade In/Out, Amplify volume, Resample, Speed Up/Down, ...). 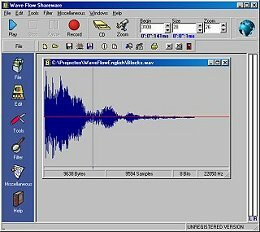 It is a full-range of advanced audio editing tool. cut/edit wave samples and convert single or multiple WAVE files. Flow Diagrams Software - Create flow diagrams and org charts rapidly! Stimulate your brain using audio waves, meditate, and try self-hypnosis. Qweas is providing links to Wave Flow 5.1 as a courtesy, and makes no representations regarding Wave Flow or any other applications or any information related thereto. Any questions, complaints or claims regarding this application Wave Flow 5.1 must be directed to the appropriate software vendor. You may click the publisher link of Wave Flow on the top of this page to get more details about the vendor.